The World of Blood series by our premier author Killion Slade, is set in an alternate history where vampires are among us, but unknown. Not for long though, the queen wants to have a coming out party. “They can’t touch you!” What could possibly go wrong at Halloween Scream Nights? As a software gaming developer, Cheyenne O’Cuinn’s task is to study fear even though she’s the biggest chickenshit on the planet. Determined to face her own fear of Oldhouseophobia, she confronts her bloodcurdling obsession – the dreaded haunted house. 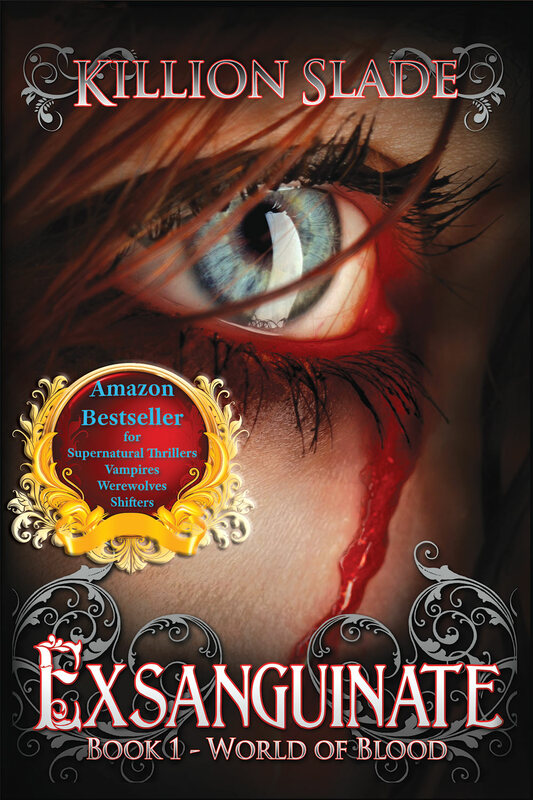 Her worst nightmare manifested, Cheyenne is brutally attacked and left for dead by a rogue vampire, but then is determined to hunt him down and return the favor. A ransom call from a kidnapper sets into motion the rabbit hole of a parallel, supernatural reality she must program inside her own role-play game to rescue her family. In a race against the hourglass, Cheyenne confronts a double-agent vampire, a cyberchondriac werewolf, and a mafioso dragon. Can they be trusted to help her, or are they a part of the twisted scheme? With her sister’s lives on the line, Cheyenne has no choice but to try and beat the kidnappers at their own game, ensnaring them with her own brand of deception. Can she fight for her life and her heart?